What Happens to My Teeth During a Dental Cleaning? When you come in for a dental cleaning in our Edmonton, AB dental office, you may wonder about the process of dental cleanings. 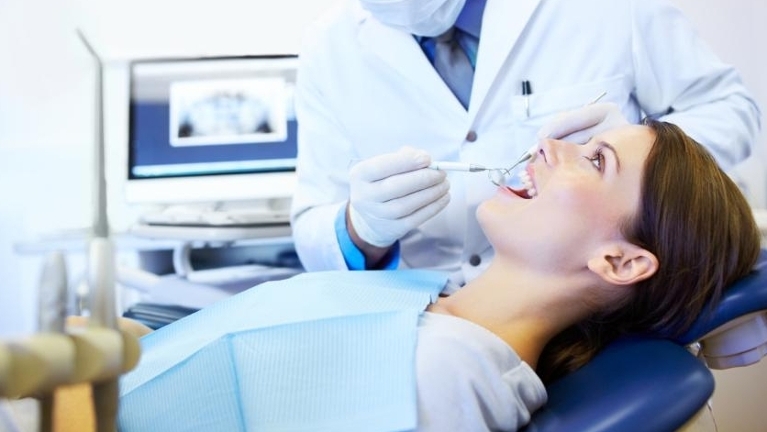 At Kingsway Dental Centre, we begin by determining the type of dental cleaning you need. Not everyone has the same oral health and we tailor our dental cleanings to meet your needs. A prophy is a dental cleaning designed for patients in generally good oral health. If you have healthy gums and stay on top of your home care, our hygienists will recommend this type of dental cleaning. Even if you are diligent at brushing and flossing your teeth, you cannot remove all of the tartar from between your teeth and near your gum line. This is why professional dental cleanings are so important! Our hygienists use precision instruments to remove tartar that has collected to keep it from irritating your gums and causing gum disease. Next, our hygienist will polish your teeth with a special paste designed to remove residual particles of tartar and surface stains. Maybe you have missed an appointment or two and you have to catch up on your dental care. We can help you get back on track! Dental cleanings at our Edmonton, AB dental office are a positive experience and our hygienists are always gentle. We will provide you with a deeper cleaning to remove tartar from above and below your gum line and provide you with a recare schedule that makes staying on track with your oral health easy! If you have had periodontal disease in the past, you may need more frequent dental cleanings to keep the infection at bay. Sometimes we recommend that patients visit our Edmonton, AB dental office 3-4 times per year for cleanings to treat periodontal disease. Our overall goal is to keep your teeth and gums healthy and beautiful! http://kingswaydentist.ca/wp-content/uploads/2014/05/medium_What-Happens-to-My-Teeth-During-a-Dental-Cleaning.jpg 432 767 Chris Kerr http://kingswaydentist.ca/wp-content/uploads/2017/03/KINGSWAY-1024x301.png Chris Kerr2014-05-27 06:31:562017-07-10 17:10:11What Happens to My Teeth During a Dental Cleaning?